I was recently asked to give a talk about Health Inequality and as part of it I dug out a graph that I used to use a lot when I worked for the Department of Health. 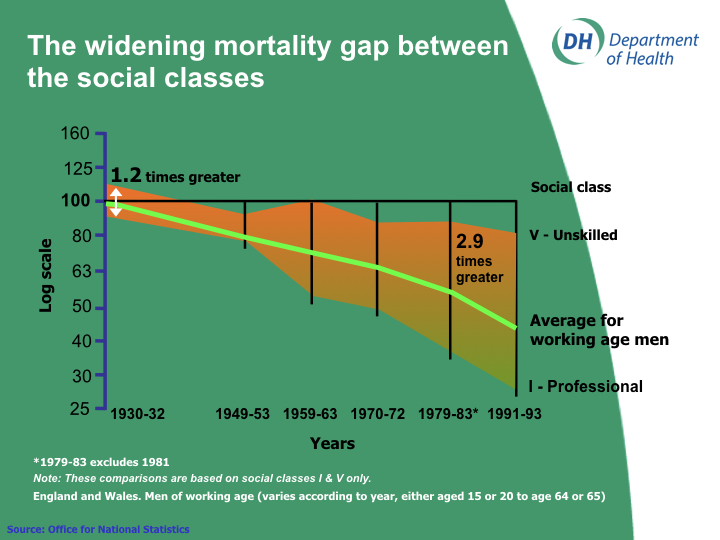 The graph shows the widening mortality gap for working age men over the last 75 years or so – it compares the top social class (I) with the bottom one (V). It starts in the 1930’s and ends in the 1990’s – I would be interested to know if there is a more up to date version. Ever since I came across this graph I have been intrigued by it. This is because I think we take an ahistorical approach to tackling inequality. In part this is because every government that comes in seems to assume that we are at year zero – witness Teresa May’s address from the steps of Downing Street when she took office, but its also because most programmes and actions assume a three to five year timespan – and as the graph shows tackling health inequalities is not a 3 or 5 year project. So lets have a look at the graph – bear in mind that the graph is comparing the gap in mortality rates for men of working age – comparing social class I (bottom line) with social class V (top line). Note there is no data for 1981 because there was a local registry officer strike that year and no records were kept. As you can see while the mortality rates for both groups goes down – it goes down far quicker for men in social class I compared to social class V.
Here are some things that stand out for me. Prior to the war the gap in mortality rates is fairly narrow and pretty stable. I assume that this is because infectious disease like TB did not discriminate between social class. Nonetheless the narrowness of this gap does surprise me. It is after the second World War that the size of the gap really starts to grow, and it does not really stop growing. This is a bit difficult for those of us who are supporters of the NHS – because this is when the NHS was created! Of course it could be that without the NHS the gap might have grown faster and been even bigger; or that the NHS had no effect at all or even worse that the NHS is one of the reasons for the growth in the gap! I have toyed around with whether this might be due in part to Tudor Harts inverse care law. However, we are talking about comparisons between social classes V so I am less convinced about this. I have wondered whether the size of the gap is in part due to other elements of the post war social contract – such as the increased social mobility bought about by improvements in access to Higher Education. When I spoke about this with Chris Bentley (albeit in the pub!) – who was head of the Department of Health; Health Inequalities National Support Team he reckoned it was because the combination of socio-economic disadvantage and burden of disease in Class V since the second world war and onwards meant that many working age men in that group just did not have the wherewithal to keep pace with Social Class I. He particularly mentioned smoking – and the failure of respective government’s to reduce smoking rates among the most disadvantaged at the same rate as for wealthier people. We are in a very difficult period of government imposed austerity. The Health Inequalities gap appears to be widening – in part because the safety net provided by the state is increasingly threadbare – we see the NHS struggling to provide a consistent and accessible service, adult social care experiencing huge cuts and welfare support diminishing – as is set out in the report by Joseph Rowntree and Dominic Harrison DPH for Blackburn. For me the lesson this graph tells us is that we need to be much better at recognising all of the systemic drivers – not just the NHS – and defending those. By the way the answer is clearly not more targeted anti-smoking leaflets at the most worse off! ← Who is afraid of the big bad Sustainability and Transformation Plan? Thanks Mark. This is a shocking graph – although I still get confused about log scales. But I’m surprised at your last comment on smoking cessation initiatives. I always thought you PH people said that, £ for £, this was always the best health investment that could be made? And somewhere in the Guardian this week I read about the money running out for such schemes. On the broader point, Chris Bentley’s explanation looks good to me. I went to a lecture by Danny Dorling and Carl Lee this week on world population growth rates, where it emerged that whilst socio-economic inequalities are expanding within countries, they are shrinking between countries. Of course, the stats for overall global comparisons are dodgier than our own, but this might suggest that health inequalities – along with other effects like family size – are shrinking from a global perspective? Ah Smoking cessation – I am on tricky territory here – however, if you look at smoking cessation at a whole population level then it probably is the best £ for £ thing you can do. After all you can count all those comparatively well off people who don’t require much of a push to give up – they have everything else sorted – income, house, etc. However, if you just look at the most worse off – the bottom quintile – then I think you will find that smoking cessation is not such good value – simply because smoking is not the immediate problem that people are dealing with – they are probably more worried about – poor housing, poor employment etc. I think smoking (& what drives it) is one of the explanations, cessation remains one of the best VFM thinks money (NHS or LA) can buy in whatever social group. The debate on ecigs and role is relevant here. This graph does need updating and not just by time, since these social group demarcations are increasingly out-of-date and less meaningful than they were. ONS has lots on this sort of stuff, though much is geographical rather than time-trends. Cheers David – lovely to hear from you! Did smoking rates in social class I really start to decline so dramatically to impact on mortality immediately after the 2nd world war? Surely this would mean that smoking rates in class had already started to decline prior to World War II? Agree with your second part it would be very useful to have an updated version of the graph – I wonder if there is any will in Public Health England to make this happen? As I say in the blog the key thing for me is that long historical view. 40% of 30 year olds with a Bangladeshi ethnicity report themselves as in fair/bad health compared to 40% of white english 70 year olds. Not surprisingly only about 15% of Bangladeshi men between 50 & 65 are in employment – I keep waiting for that statistic to stop shocking me. As a minor league player conducting his business within an a world of accreditation I would welcome the support of your organisation. I and many more are given consideration because of our professional status. Skill/ Competence still does not guarantee payment for work undertaken. Insurance assurance for you the consumer and no assurance of receiving payment. So is it worth investing in staff awareness of issues such as stress and mental health? Consider this: suicide kills six times as many construction workers as falling from heights, according to mental health charity Samaritans. This startling statistic was unveiled at a recent seminar hosted and organised by the Building Engineering Services Association (BESA), the ECA and the CIBSE Patrons. “With the amount of energy being put into managing physical risk; you have to question whether the industry is getting the health and safety balance right,” said Samaritans regional partnerships officer Will Skinner. indicated health problems social problems financial problems within our electrical industry. Cannot obtain redress from payment withheld.